This is an archive of past UESPWiki talk:Morrowind Map Design discussions. Do not edit the contents of this page, except for maintenance such as updating links. 7 What Else to Add? Before I start doing too much on this I'd like to get some feedback on what people think is right for the effects that need to be applied to the tiles. 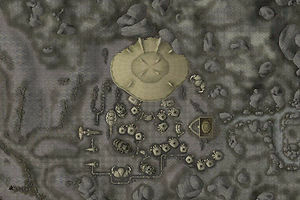 Above are two representative sections of map; one of Ald-ruhn and one of Seyda Neen at three different gamma levels; the original as exported from the game (1.0) then the same image at 1.5 and 2.0 gamma. Obviously, other values are possible and I can upload examples if anybody wants to see them, or you can see for yourself by taking the originals and applying a gamma in Photoshop, Paintshop Pto or any other paint package - the gamma effect isn't implementation-specific so it should always look the same. Somebody's going to say that they prefer it with a gamma, contrast and colour resampling or something similar. An important consideration is that this all has to be done programatically - ie, I need to be able to write the filter and apply it to over 1500 images. Simple things like contrast may be possible but I'm not rewriting chunks of a paint package here. What do we want to include: DoorMarkers? TravelMarkers? Actual door locations? Silt Striders? Should we distinguish between these? Other items of interest: corpses? Merchant mudcrab? Quest NPCs outside of cities? Should we make it possible to do a query that shows all locations relevant to a given quest? For example, mwmap.shtml?quest=Recovering_Cloudcleaver would display markers for Hlormar, Sosia, and the Caldera Mages Guild. I started adding search tags to markers, so that when you type vampire, berne, slave, propylon etc. all related locations will be listed. Works as well for traders, Smith, Clothiers and the like. Please add any other keywords that might be helpful. OK, I've added Store, Tavern, Temple, and Guild to the list. I set up Monument as an extra category because of the Bloodmoon places listed under Monuments. If there really is no difference between those and other landmarks, then I think the Bloodmoon places pages should be changed to merge the two categories, too. There is now a zoom17 level available. In other words, it's possible to zoom in one step closer to the map than previously possible. The positions of marker labels can now be changed (either globally or individually). Both of these changes should make it possible to reduce the overlap between labels in the cities. To see the changes, you'll probably have to do a hard refresh of the map in your browser (e.g., Ctrl+F5). Once I move the other maps over to the new location on the server (so all the maps are sharing the new code) then customized label locations will become available for those maps, along with a few other updates. Whatever we settle on as the default label location here will be adopted as the new default location on those maps, too. Hopefully over the next week I'll be able to get most of the migration done. Added quest keywords for all the NPCs from the last batch. At this point, |mapname= links can be added to the NPC and affected Quest pages. Is this something a bot can do? Some marker names were shortened for clarity of the display, ie. St. Delyn, Canal North-One -> Canal North-One. I think with ambushes and creature encounters we're starting to cross the line from what's more useful to what's less useful. I think the map's primary purpose should be to help readers find things that they're looking for. So places/people/creatures that you have to find as part of a quest are obvious examples of markers that need to be added. But beyond that I think we need to establish some general criteria for what we all consider to be useful. Otherwise we run the risk of bloating the map with too many markers. The more markers there are, the longer it takes to load up the map. The markers also start to add clutter to the map: they obscure the underlying terrain, and if a reader doesn't find the marker useful then it's just a distraction. The locations of the transportation services are not always obvious. If you enter the town by foot through the gate where the Silt Strider is found, you'll probably notice it. But there are many other ways to enter a town (other gates, intervention, etc.) in which case it's possible to have no idea. The transportation services are not in the middle of towns. That means that adding additional markers will not cause major problems of overlap with all the other markers already in town. It also means that the transportation services are somewhat different than other NPCs standing in town. You can't just say, for example, "standing in front of the Mages Guild" -- nor can you just use a link pointing to the Mages Guild to show where the person is found. Having the map markers will allow useful links to be added to the wiki, and will allow useful searches to be done on the map. The Silt Strider page could have a link to the map using a search on "Silt Strider" which would immediately show readers where all of the Silt Striders are located. A search on "Transportation" could be used to show where all transportation services are found. I don't think that ambushes and creature encounters add the same usefulness. Unless the ambush/creature is the target of a quest, I don't think readers are going to want to search out and find other encounters. The only usefulness I could see is that if you knew ahead of time the ambush was there, you might avoid the area. But that's a very different process: you'd only find out about the ambush if you happened to be constantly surveying your planned route along the map, using the map's maximum resolution. It would also only be useful if you're expecting the map to show you dangerous locations, which isn't the case if there are only a handful of such markers on the map. It's basically impossible to start trying to tag every place where you might encounter something hostile: imagine what the map would look like if we added every Cliff Racer and Mudcrab. Although that's a long way from what's being proposed, nevertheless, starting to add locations merely because they're potentially dangerous opens the door to that eventual possibility. Would the individual map markers be used in links from existing wiki articles? Would the group of map markers be used in a search-type link from wiki articles? (To be clear, something like the "Oblivion map" link on the Wayshrines article). Is there an obvious wiki article to use in the "Wiki Page" link on the map? Especially as we start to add less "obvious" map markers, I think it's very important that the markers have Wiki Page links so that if someone sees an odd marker and wonders what it means, they can easily pull up a wiki page that explains why the marker has been added to the map. I tweaked the MarkerType settings to what I consider to be a more logical order (and updated the one and only marker that had been using any of these types so far, namely the Mudcrab Merchant). I disabled the Silt Striders that were previously displayed on the map, so we will only have one marker per silt strider. Non-transport-related NPCs will be shown using their name. Non-transport-related NPCs will be given the marker type "NPC" (if Alive) or "Corpse" (if Dead). Transport-related NPCs will be shown using the marker Name "Silt Strider", "Boat Transport", or "Gondola". The city/canton should perhaps be added to the name (or at least to the SearchTags) but I can't easily guess at the city/canton from the data I have available. In other words, it's better for that to be done manually. Transport-related NPCs will be given the marker type "Transport". Transport-related NPCs will have the NPC's name listed in the Search Tags, as well as the keyword "Transport" (no need to repeat the Silt Strider/Boat Transport/Gondola info, since it's in the Name). All NPCs will have their Wiki Page link point to the NPC page. There are 82 NPCs in the current list. If there are any subsequent tweaks necessary to the list (either adding or deleting a NPC), those can be done manually later, as can any customization necessary for each NPC (in particular, quest names will need to be added to the Search Tags). But it seems to me that the information is in good enough shape that we should go ahead and add it, then proceed to tweak as necessary. Dead Guar - Subject of a Redoran quest - there's also some unique Mudcrabs around it, but they're not as important, and one marker should be sufficient. Staada - May not be needed as the hut that she's near should already have a marker, but she is the subject of Azura's quest, and also a character you encounter again in Shivering Isles, so might be important enough to note. The Riekling who carries the seeds needed for a Skaal quest - his Spriggan escorts probably don't need markers. The four Spriggans around Raven Rock needed for a quest - notably they should also be numbered so people know how to avoid the bug that happens if you kill them out of order. All Gibbering Lunatics, Raving Maniacs, etc. (Werewolves seen in the daytime) Even though there's only a small chance of them appearing, their spawn points should be noted as they're quite hard to find. I guess these are technically NPCs. Only other ones I can think of are the Draugr outside the shipwreck on the west coast, probably the shipwreck should have a marker, and the woman you rescue from there, but not necessarily the Draugr themselves. This page was last modified on 26 March 2013, at 02:45.